No Monday blues for their curry loving students! 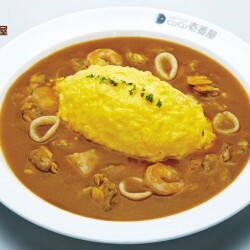 Enjoy 15% off upon presentation of your student card between 3 - 6 pm on Mondays to Fridays at CoCoICHIBANYA! Not valid with other promotions. 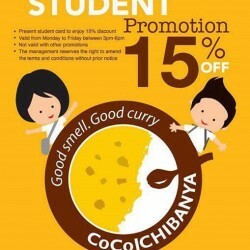 Enjoy 15% OFF upon presentation of your student card between 3 - 6 pm on Mondays to Fridays at CoCoICHIBANYA. Not valid with other promotions. For an interesting take on a curry omelette dish, try it with seafood too! 15% for students between 3 - 6 pm on Mondays to Fridays! 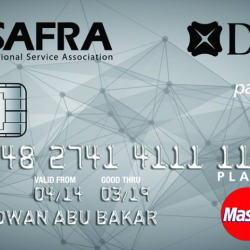 10% with a minimum spending of $50 for SAFRA members! You can now enjoy 10% with a minimum spending of $50 within one bill. Valid at All 5 Outlets. Not applicable with any other forms of promotions or vouchers. Entice your taste buds with their authentic Japanese curry today! Don't settle for less, treat yourself with the best, choose the world’s number 1 Japanese curry only at CoCoICHIBANYA! No Monday blues for their curry loving students! Enjoy 15% off upon presentation of your student card between 3:00 - 6:00pm on Mondays to Fridays at CoCoICHIBANYA! Not valid with other promotions.